If you are looking for a private venue where to organize a full adventure event, look no further ! This private piece of land of 55.000m² can be yours in full exclusivity. We will organize a full day of role playing adventure activities, under one single theme, that can be summarized as this : Escape from LostWorld... LostWorld has been taken over by its Bandits, they have control of everything : the bank, the money, the jail, the vehicles, the food... everything. Bandits roles are played by our organization. In order to survive the day, the participants will have to work in team to complete tasks and earn their release from LostWorld. Completion of tasks will earn them credits (money), LostWorlds very own currency : the Predit. The first task will see all teams competing against each other all at the same time to fill water pipes from a water supply with water containers in order to float a credit to the top of the pipe. There will be obstacles of course! The participants will then have to find the bandits hidden bank to exchange the credit for cash. The Bandits will do nothing unless they are bribed with money, so all other tasks will have to be bartered for, the teams will have to arrange a price with the bandits for everything. The better they are at the tasks the more money they will accumulate. The better they are at dealing with bandits the more money they will keep. This is a complete role playing event during a full day, including vehicles, private resort area, instructors, animation and entertainment, competition and prizes, etc. It is UNIQUE in Southern Spain ! We usually include barbecue lunch or catering in this beautiful and natural resort. All options are possible, so just send us your requests and we will make it happen. Quad driving treasure hunt – guided by a bandit they will have to find credits in different forms. Water challenge – (swimming) In LostWorld there is a huge septic tank full of steaming water, Teams can select one person or all to get in and find credits. Hay stack challenge – Lost inside a pile of straw are hidden credits (dust masks and face masks must be worn) you guessed it... they have to get them from the bandits. 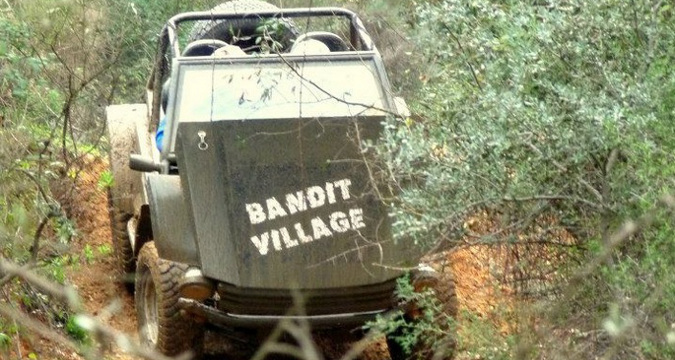 Paintball in bandit village - against the bandits – do not disturb Predator!